Select the option below to search our records, monitor and track application progress, submit comments and view documents. 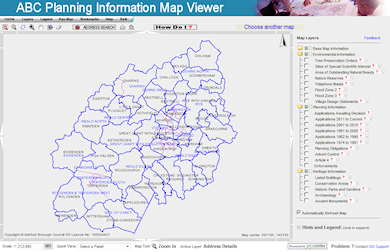 You can also find information about the area you live in on a map. This has additional information for example about the location of flood zones, veteran trees, listed buildings, mobile telephone masts, nature reserves etc. You can also arrange for us to notify you of applications in your area when they are made or identify favourite applications that you want to return to in Applications Near Me. To use this option please register in Applications Near Me.